The Legend of Zelda: A Link to the Past[a] is an action-adventure video game developed and published by Nintendo for the Super Nintendo Entertainment System video game console. It is the third installment in The Legend of Zelda series and was released in 1991 in Japan and 1992 in North America and Europe. The plot of A Link to the Past focuses on Link as he travels on a journey to save Hyrule, defeat Ganon and rescue maidens related to the Sages. A Link to the Past uses a 3/4 top-down perspective similar to that of the original The Legend of Zelda, dropping the side scrolling elements of Zelda II: The Adventure of Link. The Legend of Zelda: A Link to the Past introduced elements to the series that are still commonplace today, such as the concept of an alternate or parallel world, the Master Sword and other new weapons and items. Critics and players alike have commented on the similarities between A Link to the Past and the Nintendo 64 sequel Ocarina of Time, with some even referring to the latter as a "spiritual remake" of A Link to the Past. Released to critical and commercial success, A Link to the Past was a landmark title for Nintendo and is widely considered to be one of the greatest video games of all time. Over four million units of the game have been sold worldwide. A Link to the Past was ported to the Game Boy Advance with slight changes (see The Legend of Zelda: A Link to the Past and Four Swords), and is available for the Wii, Wii U, and New Nintendo 3DS via the Virtual Console. Nintendo re-released A Link to the Past in the United States in September 2017 as part of the company's Super NES Classic Edition. A successor to the game, titled The Legend of Zelda: A Link Between Worlds, was released for the Nintendo 3DS in November 2013. Instead of using the side-scrolling perspective introduced by Zelda II: The Adventure of Link, A Link to the Past reverts to an overhead perspective similar to that of the original Zelda. While A Link to the Past still uses mechanics and concepts from the original game, it also introduces new elements and innovations. For instance, arrows are now separate items, as bombs are in the original, instead of using a Rupee to fire an arrow. A Link to the Past also takes concepts from The Adventure of Link, such as the magic meter, which is used by items such as the Lamp. Control of Link is more flexible than in previous games, as he can walk diagonally and can run with the aid of the Pegasus Boots (Pegasus Shoes in the GBA version). Link's sword attack was improved to swing sideways instead of merely stabbing forward; this gives his sword a broader range and makes combat easier. Link swings his sword as the default attack in future Zelda games, although stabbing is also possible in the later 3D incarnations. Recurring items and techniques were introduced in A Link to the Past, such as the Hookshot, the Master Sword, the Spin Attack, and the Pegasus Boots. Heart Containers that increase the player's maximum health (hit points) are present, but many are split into "Pieces of Heart", four of which make up one Heart Container. Most of them are well hidden, adding replay value to the game. All dungeons are multi-level, requiring Link to walk between floors and sometimes fall through holes to land on lower levels. A Link to the Past is the first appearance of what would subsequently become a major Zelda trademark: the existence of two parallel worlds between which the player travels. The first, called the Light World, is the ordinary Hyrule. The second is what was once the Sacred Realm, but became the Dark World when Ganon acquired the Triforce. The Dark World is a corrupted version of Hyrule. People change forms in the Dark World based on their nature; without the Moon Pearl to prevent it, Link turns into a pink rabbit. Each location in the Light World corresponds to a similar location in the Dark World, usually with a similar physical structure but an opposite nature (e.g. a desert in the Light World corresponds to a swamp in the Dark World, a peaceful village in the Light World corresponds to a dilapidated town of thieves in the Dark World). Link can travel from the Dark World to the Light World at almost any outside location by using the Magic Mirror, and can travel back to the Dark World again from the same location using a temporary portal left behind on the map at the point where he reappears in the Light World. Otherwise, Link must use hidden warp locations throughout the Light World to travel from the Light World to the Dark World. Travel between worlds allows for puzzles in A Link to the Past that exploit structural differences between the Light and Dark Worlds, as Link may travel to otherwise inaccessible areas in one world by warping from parallel but accessible locations in the other world. Players assume the role of hero Link, a young man living with his uncle south of Hyrule Castle. Princess Zelda, a descendant of the seven sages, is held captive in the castle dungeon by Agahnim, a treacherous wizard who has set forth a chain of events to unleash Ganon. Sahasrahla, a descendant of those who forged the Master Sword, mentors Link on his quest. Series antagonist Ganon remains sealed in the Dark World. It is revealed late in the game that Agahnim is an avatar of Ganon, used by the King of Evil to infiltrate the Light World. A Link to the Past is a prequel to the original The Legend of Zelda and Zelda II: The Adventure of Link. At the beginning of the game, Link, the last descendant of the Knights of Hyrule, is awakened by a telepathic message from Princess Zelda, who says that she has been locked in Hyrule Castle's dungeon. As the message closes, Link finds his uncle ready to rescue Zelda, telling Link to remain in bed. After his uncle leaves, however, Link ignores his command and follows him through the rainy night to the dungeons under Hyrule Castle. When he arrives, he finds his uncle mortally wounded, and is told to rescue Princess Zelda, receiving his sword and shield before dying soon after. Link navigates the castle and rescues Zelda from her cell, and the two escape through a secret passage into the sewers that leads to a sanctuary. Link is told by the priest in the sanctuary that Agahnim, a wizard who has usurped the throne and bewitched the king's soldiers, is planning to break a seal made hundreds of years ago by the Seven Sages to imprison the dark wizard Ganon in the Dark World, which was known as the Sacred Realm before Ganon, then known as Ganondorf, invaded it, obtained the Triforce, and used its power to engulf the realm in darkness. Agahnim intends to break the seal by sending the descendants of the Seven Sages into the Dark World. The only thing that can defeat Agahnim is the Master Sword, a sword forged to fight evil that can only be wielded by the chosen hero. To prove that he is worthy to wield it, Link needs three magic pendants, representing the virtues of Courage, Wisdom and Power, hidden in dungeons guarded by mythical defenders. On his way to retrieve the first, he meets an elder, Sahasrahla, who becomes his mentor. After retrieving the pendants, Link takes them to the resting place of the Master Sword. As Link draws the sword from its pedestal, Zelda telepathically calls him to the Sanctuary, informing him that soldiers of Hyrule Castle have arrived. Link arrives at the Sanctuary moments after the soldiers have vacated, where he learns from the dying Sanctuary keeper that Zelda has been taken to Hyrule Castle. Link goes to rescue her but arrives too late; Agahnim sends Zelda to the Dark World. Link then faces Agahnim in battle and defeats him, but he manages to use the last of his power to send Link to the Dark World as well. To save Hyrule, Link must rescue the descendants of the Seven Sages from dungeons scattered across the Dark World, each guarded by one of Ganon's minions. Once the seven maidens are freed, they use their power to break the barrier around Ganon's Tower, where Link faces a reincarnated Agahnim, who creates two ghostly specters each as powerful as he is. After Link defeats Agahnim for a second time, Ganon rises from his body, turns into a bat, and flies away. Link chases Ganon and confronts him inside the Pyramid of Power at the center of the Dark World. After a battle resulting in Ganon's demise, Link touches the Triforce and restores the Dark World and Hyrule to their previous state, brings his uncle and the sanctuary keeper back to life, and restores Zelda's father, the true king. In 1988, development of a new NES Zelda began, but one year later, the project was brought to Nintendo's next console; the Super Famicom in Japan, the Super Nintendo Entertainment System in other regions. Due to the success of previous titles in the series, Nintendo was able to invest a large budget and ample development time and resources into the game's production. At the time, most SNES game cartridges had 4 Mbit (512 KB) of storage space. This game broke the trend by using 8 Mbit (1 MB), allowing the Nintendo development team to create a remarkably expansive world for Link to inhabit. Like Super Mario World, this game used a simple graphic compression method on the SNES by limiting the color depth of many tiles to eight colors instead of the SNES's native 16-color tiles. The tiles were decompressed at runtime by adding a leading bit to each pixel's color index. Storage space was also saved by eliminating duplication: The Light World and the Dark World are almost identical in layout (though using differing texture tiles), and the Dark World exists in the game's ROM only as an "overlay" of the Light World. The script of the game was written by series newcomer Kensuke Tanabe, while Yoshiaki Koizumi was responsible for the background story explained in the instruction manual. The English language localization included changes to the original Japanese game. The most common change was the removal of religious references to conform with Nintendo of America's content guidelines. The most obvious change was made to the subtitle of the game, which was renamed from Kamigami no Triforce (lit. "The Triforce of the Gods") to A Link to the Past. The "Sanctuary" in which Zelda hides during the first act is quite obviously modeled on the Christian chapel, with rows of pews, stained glass windows, a raised chancel and altar, but it contains no overt religious symbols, and the dialogue of characters within it was simplified to remove any religious implication. The font used to represent an unreadable language, Hylian, originally had designs of a vulture and an ankh. These designs were based on Egyptian hieroglyphs which carry religious meanings, and they were altered in the English version. The localization also changed plot details included in the instruction manual. The priest Agahnim became a wizard, and his background, which originally implied that he was sent by the gods, was altered to remove any celestial origin. The score to A Link to the Past was composed, arranged, and produced by Koji Kondo. The overworld theme of The Legend of Zelda ("Hyrule Overture") returns in A Link to the Past, redone in S-SMP style. The theme is also featured in "Light World Overworld" and in "End Credits". A Link to the Past helped to establish the musical core of the Zelda series. While the first game originated the "Hyrule Overture", many recurring motifs of the Zelda scores come from A Link to the Past, including "Zelda's Lullaby" (Princess Zelda's Theme), "Ganondorf's Theme", "Hyrule Castle" (Royal Family Theme), "Kakariko Village" and "Select Screen/Fairy Cave". These themes have been used in subsequent The Legend of Zelda games. A soundtrack to Kamigami no Triforce, entitled The Legend of Zelda: Sound and Drama, was released by Sony Records in Japan on June 22, 1994. The first disc is 44 minutes long and features rearranged versions of a selection of the game's themes, along with a bonus drama track. The second disc features 54 minutes of the original arrangements for the game and those of the original NES game, The Legend of Zelda. A Link to the Past is one of the best-selling SNES games, with 4.61 million units sold worldwide, and has had an exceptionally long stay on Nintendo Power's top games list (ranking number 2 in Nintendo Power's last issue in December 2012): when the SNES list was finally retired, A Link to the Past had more than five consecutive years in the number one spot. It was re-released as a Player's Choice title in North America, indicating that it has sold a minimum of one million copies there. In the United States, A Link to the Past's Game Boy Advance version alone sold 1.4 million copies and earned $41 million by August 2006. During the period between January 2000 and August 2006, it was the 8th highest-selling game launched for the Game Boy Advance, Nintendo DS or PlayStation Portable in that country. Entertainment Weekly picked the game as the #4 greatest game available in 1991, saying: "Completely addicting, especially for unsuspecting adults." A Link to the Past was critically acclaimed upon release for its graphics and gameplay, and has since been recognized by critics as one of the greatest video games of all time. In 2005, IGN editors placed it 11th in its "Top 100 Games", while readers voted it to 5th place. The following year Entertainment Weekly chose it as the best game of all-time. Members of GameFAQs ranked it the 4th best, and readers of Japanese magazine Famitsu ranked it 31st in a 2006 poll. It also placed 3rd in Electronic Gaming Monthly's list, 23rd in Game Informer's, and 3rd in a best 200 Nintendo games list by Nintendo Power. In July 2007, readers of the magazine Edge voted it sixth in a poll of the 100 best games of all time. ScrewAttack placed it 2nd on their list of top 20 Super Nintendo games. GamesRadar named A Link to the Past the 3rd best Super NES game of all time, losing only to Chrono Trigger (2nd) and Super Metroid (1st). It was awarded Best Sequel of 1992 by Electronic Gaming Monthly. The game placed eighth (the second-highest Zelda game on the list) in Official Nintendo Magazine's "100 greatest Nintendo games of all time" list. In 2009, Game Informer put A Link to the Past 12th on their list of "The Top 200 Games of All Time", saying that it "remains a blast today". This is 11 places ahead of the rank it had back in 2001. The game was reviewed in 1993 in Dragon No. 198 by Sandy Petersen in the "Eye of the Monitor" column. Petersen gave the game 5 out of 5 stars. A Link to the Past & Four Swords for the Game Boy Advance received positive reviews and sold over 1.81 million units. IGN praised it for being a faithful conversion of the original, but noted that the audio did not sound as crisp on the Game Boy Advance, and found the frequent sound effects tiresome. The game holds the top spot of Metacritic's all-time high scores for Game Boy Advance games with a score of 95. In 2007, IGN named A Link to the Past & Four Swords the third best Game Boy Advance game of all time. GamePro's Star Dingo called it a "masterpiece," as well as an "important part of the Grand Renaissance of the Second Dimension." He also praised the overworld for its secrets and "quirky random characters," adding that playing it required patience and exploring. Star Dingo praised the port of A Link to the Past's ability to retain its visuals. He specifically praises its "clean sprites," calling its overworld a "colorful, happy place," sarcastically calling it kiddy. He also questioned how the series' cartoon style was abnormal for the series. Star Dingo called the sound effects "indelible," though he noted that they were "a little dated." UGO Networks compared Four Swords to The Legend of Zelda: Oracle of Ages and Oracle of Seasons, calling it "similarly gimmicky". They commented that the best Four Swords brought was its sequel, The Legend of Zelda: The Minish Cap. 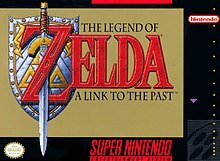 CNET praised both the original A Link to the Past release as well as the Four Swords multiplayer mode, calling the former a "great handheld port of one of the greatest games ever released for Nintendo's 16-bit system", while describing the latter as "an exciting, replayable multiplayer experience". Nintendo Power held a contest which selected a winner at random to appear in an upcoming Nintendo game. At the time, it was not revealed which game it would be. A certain single room in A Link to the Past contained 45 Blue Rupees and a note bearing a greeting from Chris Houlihan, the winner of the contest. The room has been found through five different methods, and was intended as a crash prevention measure; the game would send players to this room if it couldn't determine where Link was going when he goes to another area. The message reads: "My name is Chris Houlihan. This is my top secret room. Keep it between us, okay?" There was not wide awareness of the room until more than a decade after the release of A Link to the Past after the increased popularity of the Internet and Super NES emulators. The Game Boy Advance re-release of A Link to the Past titled The Legend of Zelda: A Link to the Past & Four Swords removed the ability to access the room, though it could still be found in the game's code. The Virtual Console re-releases on the Wii and Wii U of A Link to the Past however allowed players to access the room. GamesRadar included it in its lists of the greatest video game Easter eggs and the nine "video game secrets that were almost never found." GamesRadar's Jason Fanelli called it "one of the Zelda franchise's biggest mysteries." GamesRadar's Justin Towell included it in his list of the top seven secret rooms in video games at number two. He felt that the contest prize was exciting, and called it "one of the coolest and most exclusive secrets in the Zelda universe." 1UP.com featured it in its list of "25 things you didn't know about The Legend of Zelda." Australian Broadcasting Corporation's Good Game, The Escapist, IGN, GameSpy, G4TV, PALGN, and Nintendo Life referenced it in articles which discuss video game Easter eggs and secrets. A comic book adaptation of A Link to the Past illustrated by Shotaro Ishinomori was published in Nintendo Power that was serialized for 12 issues from January to December 1992. The comic was then re-released as a trade paperback in 1993. The comic is a loose adaptation of the original game's story, featuring several plot changes and new characters. Two other manga were released in Japan: a manga by Ataru Cagiva from 1995 to 1996 that was serialized in Enix Corporation's Monthly GFantasy and later collected into three volumes and a one-volume manga by the duo Akira Himekawa released in 2005 corresponding with the release of Game Boy Advance version. Both follow the game's plot more closely, and the latter introduced a new character called "Ghanti", a thief with a single devil's horn and a star under her eye. A French version of this game was released in Canada, making it the only French-only release in North America for the SNES. This version had the same case as the English release in North America, but the whole game was translated in French. On December 2, 2006 in Japan and January 22, 2007 in America, the game was added to the Wii Shop Channel's Virtual Console. Players can download the game for 800 Wii Points, or US$8. The English version is nearly identical to the English SNES version, with none of the GBA additions or changes. The next Zelda title, Link's Awakening was released in 1993 for the Nintendo Game Boy. It retained many of A Link to the Past's gameplay mechanics, including the top-down perspective, as well as an overworld which resembled that of A Link to the Past. After traveling to train abroad, Link is shipwrecked and awakens on an island called Koholint. Beginning on March 2, 1997 a simple unaltered re-release of the original Japanese version of A Link to the Past was broadcast via Satellaview. The game would be rebroadcast more often than any other Zelda title on the Satellaview, and was the only Zelda title broadcast by St.GIGA after ties with Nintendo were broken in April 1999. Unlike the two other Satellaview Zelda titles, Kamigami no Triforce lacked SoundLink support. Apart from official sequels and re-releases made or licensed by Nintendo, A Link to the Past has proven to be very popular within the game-modding community, inspiring the development of numerous fangames, such as the unofficial 2007 sequel The Legend of Zelda: Parallel Worlds. In 1997, a follow-up entitled BS Zelda no Densetsu: Inishie no Sekiban (lit. "BS The Legend of Zelda: Ancient Stone Tablets" or "Stone Tablets of Antiquity") was released in Japan. Designed exclusively for the Super Famicom's Satellaview peripheral, the game would make notable use of a voice broadcast system called SoundLink to provide voice-acting for several of the characters from A Link to the Past. The game takes place six years after the events in A Link to the Past and it is set in Hyrule's Light World. The game notably lacks a Link character, and instead the player character is known as the Hero of Light. The available player-characters are actually the male and female BS-X avatars that also featured in BS Zelda no Densetsu. The game was divided into four weekly episodes. These episodes were played live, and a voice-acted soundtrack simultaneously ran on the satellite network, sometimes containing suggestions, clues, and plot development for the game currently being broadcast. Each week, the player could only access certain portions of the overworld. Areas shrouded in clouds were unreachable. Two dungeons were accessible per week, however the episode ended only when time expired and not when the player had completed all the objectives for that week. The game could only be played during the set hours because the SoundLink content was central to gameplay (and not stored on the base unit or flash-RAM cartridge in any way), and the timer was based on a real-time clock set by the satellite itself. The game was re-released for the Game Boy Advance in 2002 in North America and 2003 in other territories as part of The Legend of Zelda: A Link to the Past and Four Swords, a collaborative development effort between Nintendo and Capcom. The port of A Link to the Past contains minor changes from the original, including the addition of vocal grunts and other sound effects taken from Ocarina of Time and Majora's Mask. Four Swords is a multi-player adventure that interacts with the single-player adventure. 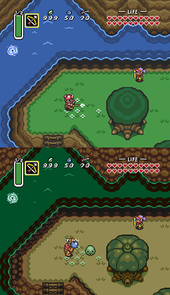 Accomplishments can be transferred between the two; for example, if the player learns a new sword technique, it is made available in both modes. By completing Four Swords, a new dungeon called the Palace of the Four Sword is unlocked in A Link to the Past. In Four Swords, dungeons are randomly generated and are affected by the number of players. If only two players are active, the game ensures that all puzzles generated do not require a third or fourth player to solve. The plot of Four Swords revolves around the wind mage Vaati, who escapes from the Four Sword he is sealed in and captures Princess Zelda to marry her. Link uses the Four Sword to create three copies of himself and rescues Zelda, trapping Vaati in the sword once again. At the time of its release, the story of Four Swords was considered the oldest tale in the series' timeline. In 2011 Shigeru Miyamoto expressed desire to have A Link to the Past remade for the Nintendo 3DS, stating how attractive the two layers would look. In April 2013, Nintendo announced in its Nintendo Direct presentation that a new game based on the same world as A Link to the Past was currently in development for Nintendo 3DS, featuring new 3D visuals. On November 22, 2013, Nintendo released The Legend of Zelda: A Link Between Worlds, which takes place in the same world, but features a new storyline, new puzzles and original dungeons. Height and depth play a large role in the game by taking advantage of the 3D feature of the 3DS, while maintaining the traditional top-down perspective. A Link to the Past is a popular game for speedrunning, having the fourth-most players of all games listed on Speedrun.com. It is commonly run at the Games Done Quick charity marathon, where it is often considered one of the highlights of the event. Many speedrunners also play using A Link to the Past: Randomizer, a mod that randomizes the locations of most of the game's items, in an attempt to evoke the uncertainty and excitement of playing the game for the first time. ^ "Nintendo published Super Famicom listing". Nintendo. Retrieved March 31, 2008. ^ McWhertor, Michael. "The Legend of Zelda: A Link to the Past sequel coming to Nintendo 3DS this holiday". Polygon. Vox Media Inc. Retrieved December 31, 2014. ^ Schreier, Jason. "The New 3DS Zelda Is Called A Link Between Worlds". Kotaku. Kotaku. Retrieved December 31, 2014. ^ a b c d e Nintendo (April 13, 1992). The Legend of Zelda: A Link to the Past. SNES. Nintendo. ^ a b c d Nintendo (December 2, 2002). The Legend of Zelda: A Link to the Past & Four Swords. Game Boy Advance. Nintendo. ^ a b c d Arakawa, M. (1992). The Legend of Zelda: A Link to the Past Nintendo Player's Strategy Guide. Nintendo. ASIN B000AMPXNM. ^ a b c d Stratton, Bryan (December 10, 2002). The Legend of Zelda — A Link to the Past. Prima Games. ISBN 0-7615-4118-7. ^ "A Link To Link's Past: The History Of Zelda". Game Informer. November 20, 2006. Archived from the original on October 12, 2007. Retrieved March 14, 2007. ^ Nintendo (January 1, 2006). "Sahasrahla" at the official "Great Hyrule Encyclopedia". Zelda Universe. Archived from the original on April 16, 2005. Retrieved June 29, 2007. ^ "Zelda no Densetsu: Kamigami no Triforce – Back Cover" (in Japanese). Nintendo (via MobyGames). November 21, 1991. Retrieved June 10, 2010. 今度の舞台はリンクが活躍した頃よりも遥か昔、ハイラルが、まだ一つの王国であった時代。 /. This time, the stage is set a long time before Link's exploits, an era when Hyrule was still one kingdom. ^ "Interview". Dengeki Nintendo 64. MediaWorks, Inc. January 1999. Shigeru Miyamoto: (時オカ→神トラ)それから初代ときてリンクの冒険という順番になる。 / Ocarina of Time, A Link to the Past, then comes the original one and The Adventure of Link in turn. ^ a b Nintendo, ed. (1992). The Legend of Zelda: A Link to the Past instruction manual. Nintendo. ^ Schneider, Peer (April 21, 2006). "Retrospective: The Legend of Zelda: A Link to the Past". IGN. Retrieved March 14, 2007. ^ "Legend of Zelda—A link to the Past". Ludogo. Archived from the original on April 5, 2008. Retrieved March 29, 2008. ^ Gouskos, Carrie (March 14, 2006). "The Greatest Games of All-Time: The Legend of Zelda: A Link to the Past". GameSpot. Retrieved March 7, 2007. ^ "Shigeru Miyamoto Interview". Super PLAY (in Swedish). Medströms Dataförlag AB (4/03). March 2003. Archived from the original on June 23, 2004. Retrieved September 24, 2006. ^ Kohler, Chris (December 4, 2007). "Interview: Super Mario Galaxy Director On Sneaking Stories Past Miyamoto". Wired: GameLife. Condé Nast Digital. Retrieved June 10, 2010. Yoshiaki Koizumi: My first assignment was to do the art and layout and eventually the writing for the manual for The Legend of Zelda: A Link To The Past. What was funny was that at the time, it didn’t seem like they’d really figured out what most of the game elements meant. So it was up to me to come up with story and things while I was working on the manual. So, for example, the design of the goddesses as well as the star sign associated with them. ^ "The Legend of Zelda: A Link to the Past". IGN. Archived from the original on December 2, 2007. Retrieved March 31, 2008. ^ Thomas, Jared (February 24, 2007). "The Legend of Zelda: Twilight Princess". N-Philes. Archived from the original on March 20, 2012. Retrieved March 29, 2008. ^ "The Legend of Zelda: Sound and Drama reviews". SoundtrackCentral.com. Retrieved March 7, 2007. ^ "Full Song List with Secret Songs". Smashbros. Retrieved April 9, 2008. ^ Reges, Julia. "The Legend of Zelda: A Link to the Past – Review". AllGame. Archived from the original on November 14, 2014. Retrieved June 17, 2011. ^ Marriott, Scott Alan. "The Legend of Zelda: A Link to the Past – Review". AllGame. Archived from the original on November 14, 2014. Retrieved March 3, 2015. ^ Harris, Steve; Semrad, Ed; Alessi, Martin; Sushi X (March 1992). "Review Crew: Zelda III". Electronic Gaming Monthly. Ziff Davis Media (32): 22. ^ スーパーファミコン SUPER FAMICOM - ゼルダの伝説 -神々のトライフォース-. Weekly Famicom Tsushin. No.225. Pg.90. April 9, 1993. ^ "ProReviews: The Legends of Zelda: A Link to the Past". GamePro. IDG Communications (37). August 1992. ^ a b c d Dingo, Star. "The Legend of Zelda: A Link to the Past Review from". GamePro. Archived from the original on August 15, 2010. Retrieved October 1, 2011. ^ a b c Gerstmann, Jeff (December 9, 2002). "The Legend of Zelda: A Link to the Past GBA review". GameSpot. Retrieved June 19, 2007. ^ a b Harris, Craig (December 3, 2002). "Legend of Zelda: A Link to the Past". IGN. Retrieved March 19, 2007. ^ George Sinfield & Rob Noel (March 1992). "Now Playing: The Legend of Zelda: A Link to the Past". Nintendo Power. Nintendo of America (34): 105. ^ a b "The Legend of Zelda: A Link to the Past Reviews". GameRankings. Retrieved April 30, 2007. ^ a b "Legend Of Zelda: A Link to the Past, The". Metacritic. Archived from the original on June 4, 2008. Retrieved April 6, 2008. ^ a b "The Legend of Zelda: A Link to the Past reviews". GameRankings. Retrieved March 7, 2007. ^ a b Tenchi (March 28, 2004). "Zelda sales charts and sequel announced". OptiGamer. Archived from the original on February 23, 2005. Retrieved December 3, 2005. ^ "The Legend of Zelda: A Link to the Past — Cover Art". MobyGames. January 1, 2007. Retrieved March 17, 2007. ^ Thomas, Lucas M. "The Legend of Zelda: A Link to the Past VC Review". IGN. Retrieved March 20, 2007. ^ "IGN's Top 100 Games: 11–20". IGN. Retrieved November 17, 2006. ^ "Reader's Picks Top 10 games: 1–10". IGN. Archived from the original on November 3, 2013. Retrieved November 17, 2006. ^ "The 100 greatest video games". Entertainment Weekly. January 1, 2006. Archived from the original on September 18, 2006. Retrieved November 17, 2006. ^ Campbell, Colin (January 1, 2006). "Japan Votes on All-Time Top 100". Next Generation. Retrieved March 11, 2006. ^ "Electronic Gaming Monthly's 100 Best Games of All-Time". gamers.com. January 1, 2001. Archived from the original on June 11, 2003. Retrieved November 17, 2006. ^ "Top 100 Games of All-Time". Game Informer. 100: &nbsp, 34. August 2001. ^ "NP Top 200". Nintendo Power. 200: &nbsp, 58–66. February 2006. ^ "Zelda game named 'greatest ever'". BBC. July 1, 2007. Retrieved February 1, 2008. ^ "ScrewAttack Top 20 SNES Games (10–1)". ScrewAttack's Top 10. ScrewAttack. April 7, 2008. Archived from the original on March 8, 2013. Retrieved April 12, 2008. ^ GamesRadar staff (April 17, 2012). "Best Super Nintendo games of all time". GamesRadar. Archived from the original on May 2, 2014. Retrieved February 2, 2013. ^ East, Tom. "100 Best Nintendo Games – Part Six". Official Nintendo Magazine. Future plc. Archived from the original on February 20, 2011. Retrieved March 2, 2009. ^ Cork, Jeff (November 16, 2009). "Game Informer's Top 100 Games Of All Time (Circa Issue 100)". Game Informer. Retrieved December 10, 2013. ^ "The Legend of Zelda: A Link to the Past reviews". GameRankings. Retrieved March 7, 2007. ^ Harris, Craig (March 16, 2007). "Top 25 Game Boy Advance Games of All Time". IGN. Retrieved March 18, 2007. ^ "The Legend of Zelda: A Link to the Past reviews". Metacritic. Retrieved March 7, 2007. ^ Rosenberg, Adam (October 26, 2007). "Legend of Zelda: Four Swords, Minish Cap, Four Swords Adventures". UGO.com. Archived from the original on June 15, 2011. Retrieved October 1, 2011. ^ mgalster – September 17, 2005 (September 17, 2005). "The Legend of Zelda: A Link to the Past (Game Boy Advance) – Game Boy Advance Games – CNET Archive". Reviews.cnet.com. Retrieved October 1, 2011. ^ Smith, Ernie (March 13, 2017). "Chris Houlihan Room: The Legend of Zelda's Best Easter Egg". Tedium. Retrieved June 25, 2017. ^ a b Taljonick, Ryan; Gilbert, Henry (April 18, 2014). "The 100 best Easter Eggs of all time". GamesRadar. Retrieved May 4, 2014. ^ a b Winterhalter, Ryan (February 20, 2011). "25 Things You Didn't Know About The Legend of Zelda". 1UP.com. Archived from the original on January 28, 2016. Retrieved January 28, 2016. ^ a b c Leigh, Chris (April 8, 2007). "PALGN's Easter Egg Hunt". PALGN. Archived from the original on May 4, 2014. Retrieved May 4, 2014. ^ a b Towell, Justin (June 23, 2012). "The Top 7... secret rooms in video games". GamesRadar. Retrieved May 4, 2014. ^ a b Fanelli, Jason (April 23, 2014). "9 video game secrets that were almost never found". GamesRadar. Retrieved May 4, 2014. ^ "Easter Eggs". American Broadcasting Company. April 13, 2009. Retrieved May 4, 2014. ^ Main, Brendan (January 18, 2011). "The Minus Touch". The Escapist. Retrieved May 4, 2014. ^ Whitehead, Thomas (March 31, 2013). "Feature: The Nintendo Easter Egg Hunt". Nintendo Life. Retrieved May 4, 2014. ^ "Gaming's Top 10 Easter Eggs". IGN. April 9, 2009. Retrieved May 4, 2014. ^ Hoovler, Evan (March 24, 2011). "10 Ridiculous Old-School Video Game Rumors (That Were Actually True)". GameSpy. Retrieved May 4, 2014. ^ "7 Insane Video Game Secrets And Easter Eggs". G4TV. April 25, 2012. Retrieved May 4, 2014. ^ "Comics". Ganon's Tower. Archived from the original on December 20, 2007. Retrieved March 31, 2008. ^ a b "The Legend of Zelda manga". McLoz. Archived from the original on February 28, 2007. Retrieved March 7, 2007. ^ a b "A link to the past: kamigami no triforce manga" (in French). The Hyrule Bookshop. Retrieved March 14, 2007. ^ Nintendo (December 31, 1993). The Legend of Zelda: Link's Awakening. Game Boy. Nintendo. ^ Kameb. スーパーファミコンアワー番組表 Archived May 1, 2012, at WebCite. The Satellaview History Museum. February 12, 2008. ^ "A New SNES Zelda". UGO. January 9, 2007. Archived from the original on December 24, 2011. Retrieved August 30, 2015. ^ Luke, Plunkett (January 10, 2007). "LttP Remade As Zelda: Parallel Worlds". Kotaku. Gawker Media. Archived from the original on January 23, 2012. Retrieved April 17, 2013. ^ Hacking is Cool: Shame They Don't Teach It at School. Retro Gamer. Issue 35. Pg 99. March 2007. ^ a b c "Retrospective: BS Zelda". IGN. June 8, 2006. Retrieved April 5, 2008. ^ BS The Legend of Zelda: The Ancient Stone Panel IGN. Retrieved July 9, 2010. ^ Nintendo (March 30, 1997). BS Zelda no Densetsu: Inishie no Sekiban (in Japanese). Satellaview. St.GIGA. Narrator: 6年前、勇者リンクが魔王ガノンを倒してから、このハイラルの地には平穏な日々が流れていた。 / 6 years ago, the Hero Link threw down the King of Evil, Ganon. Since then, the land of Hyrule has basked in a time of peace. ^ Nintendo; Capcom Co., Ltd. (December 2, 2002). The Legend of Zelda: A Link to the Past & Four Swords. Nintendo of America, Inc. Scene: startup screen. ^ Moriarty, Colin. "The Legend of Zelda: A Link to the Past guide". IGN. p. 21. Retrieved March 19, 2007. ^ "The Legend of Zelda: A Link to the Past Cheats For Game Boy Advance". GameSpot. Retrieved March 19, 2007. ^ Nathan Brown (April 22, 2011). "Miyamoto: "We'll Focus More On Gaming"". Edge Magazine. Retrieved April 22, 2011. ^ Brian Ashcraft. "The Next 3DS Zelda Is Set In The World Of Link To The Past". Kotaku. Gawker Media. ^ O'Rourke, Patrick. "Nintendo announces The Legend of Zelda: A Link To The Past 2". Canada.com. Retrieved April 17, 2013. ^ Good, Owen (January 12, 2019). "Awesome Games Done Quick 2019: what to watch on the last day". Polygon. Retrieved January 13, 2019. ^ Beck, Kellen (January 6, 2017). "Here are 25 speedruns worth watching this week". Mashable. Retrieved January 13, 2019. ^ D'Argenio, Angelo (January 16, 2018). "The 10 Best Speedruns of AGDQ 2018". GameCrate. Retrieved January 13, 2019. ^ Schreier, Jason (July 10, 2017). "The Best Speedruns From SGDQ 2017". Kotaku. Retrieved January 13, 2019. ^ Schreier, Jason (July 20, 2016). "People Are Doing Remarkable Things With Zelda: A Link to the Past". Kotaku. Retrieved January 13, 2019. ^ Known in Japan as The Legend of Zelda: Triforce of the Gods (ゼルダの伝説 神々のトライフォース, Zeruda no Densetsu: Kamigami no Toraifōsu).